Many, if not most, NRL News Today readers know of Snopes.com. It’s one of those self-important “fact-checking sites” which just happen to unwaveringly come to the politically correct conclusion which includes virtually always giving a thumbs-up to pro-abortion charges and a thumbs-down to pro-life contentions. The Babylon Bee, by contrast, is lesser known. It describes itself as “a satirical evangelical Christian website.” As the Washington Post said many years ago, “What would the Onion look like if it were written for the godly?” Take my word for it, godly or otherwise, you will find them hilarious. Well, I’m not sure anything can improve Snopes. 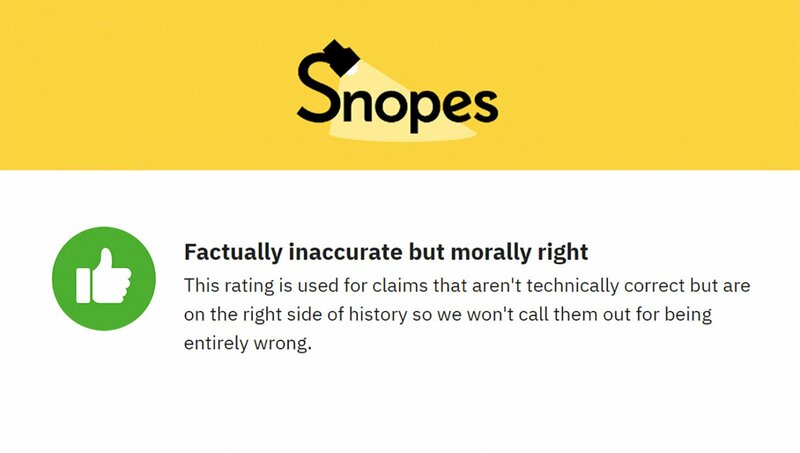 But “Snopes Introduces New ‘Factually Inaccurate But Morally Right’ Fact Check Result” not only “exposes and criticizes foolishness” that is Snopes’ stock and trade, yesterday’s Babylon Bee captures perfectly what we see more and more of in the public arena. That is, whether an assertion does not bare even the faintest resemblance to the truth, provided it is (to the “progressive” mind) “morally right,” it doesn’t matter. Put another way, if someone’s motives are (in their own mind) pure, then facts, logic, and certainly outcomes just don’t matter. It’s a chance to preen, to flaunt your virtue. Consider the irony. The same people who blast pro-lifers with such intensity their keyboards melt for the “crime” of disagreeing with them will often make the most outlandish claims. They can get away with this not because their “facts” are more accurate than ours but because their motives are so pure it just doesn’t matter to outlets like Snopes and the major media. When The Babylon Bee ends with “The new label has been used 17 times on Snopes today alone,” it is a reminder that good satire is very effective often because it is so close to what is actually taking place. Eliminate humanity for the good of the planet?